How much data is your building generating? Are you getting any value from it? Even if you are not operating state of the art smart buildings with nearly 30,000 sensors, the chances are that you will soon be swimming in data. Industry estimates suggest that we’re well past 500 million end points from commercial buildings, and heading towards 3.5 billion in the next three years (thanks, Gartner). That’s end points…each one delivering a data stream at rates potentially of many times a minute. Its a crazy amount of data, and it won’t be tractable without some deep thinking on applications and analytics. If properly harnessed it offers huge scope to improve the efficiency of buildings and their capacity to deliver comfort and improve productivity for the people working in them. For that to happen, though, building operators need to get a bit cleverer about their data and clearer about what their data strategy needs to be. A good data strategy will clarify the value of the data being collected and ensure it is fit for purpose – sadly not the case in so many buildings right now. A simple example – consider the difference between a supply air temperature sensor 3M up in an office ceiling and a desk level comfort sensor. This difference is not just location, but also the rate of update and data availability for analysing previous periods. Lower data rates may be good for control applications, but there are certain applications that are only possible with higher data rates. So data strategy should help flush out what you want from your data, which drives some important decisions about what, where and how frequently to measure. The best – and simplest – first step is to assess what your goals are for data. What are the really valuable applications? 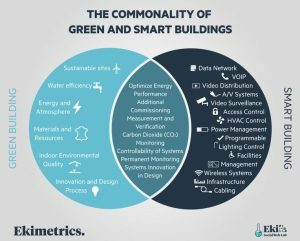 For most commercial buildings the two major categories of time related data – metering data and building management systems – have obvious lead applications – settling energy bills and controlling building services, but they typically need some enhancement to be able to support detailed building analytics. System innovation in design – Identifying new opportunities for energy savings and improved productivity by making major changes to environment. The evidence is that these applications add real value to buildings – green buildings are typically 25 – 35% lower to operate and occupiers report 4% more productivity from staff. Excitingly, it seems there is potential to apply some of these to buildings that haven’t originally been conceived as green or smart, to improve them. As a quick, scaleable win for occupiers and operators of commercial, data has huge potential, if it is structured correctly. Purrmetrix can help fill in gaps and support your analytics – if you want to know more, do get in touch.